'Tim A,' in the comments of my last series of posts covering F-35 KPPs and 'Transonic Acceleration', piqued my interest in doing a comparative analysis of the F-35A's transonic acceleration KPP against a hypothetical, lightweight Block 60 F-16E that LM built for UAE. We can only 'estimate' and in the case of the F-16E/F the estimates can, I believe, be regarded as fair approximations since they are based upon F-16 Block 50 data in hand. Excursions away from the F-35 KPP data will be more presumptive, but we will not venture too far away from 'firmer ground'. To do the comparison that we want to do, will first require us to make some reasonable assumptions (and remember they are assumptions) concerning the Block 60 aircraft and how they differ from, or are materially the same as, the more well-known Block 50 aircraft. There is little 'hard' data available beyond certain basic information on the Block 60 configuration. The United Arab Emirates funded the development of this version in its entirety, and there is no 'Dash 1' manual in the public domain (that I am aware of) that could provide us with the 'authoritative' source for the information we seek. In any case, the factors most important to our discussions will be the establishment of an acceptable aircraft empty weight, and evaluation on what effect the Block 60's higher thrust engine (32,500 lbs vs 29,000 lbs of thrust in afterburner) would have on overall performance. 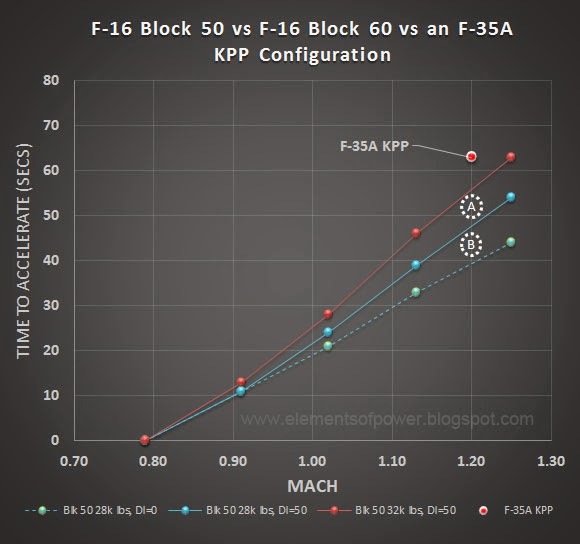 A major factor that might warp our evaluation of the Block 60 against the F-35A KPP performance--if we let it --would be quantifying the effect of wave and other drag differences between F-16 Block 50 and Block 60. My approach will be to do so in a manner that passes the "Reasonable Man' test. As the purpose of this exercise is to get an idea as to how well the 'future' (i.e. 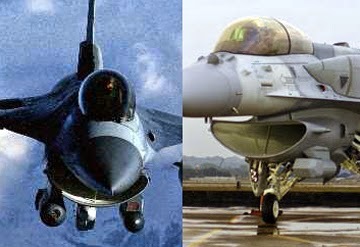 F-35A) stands up in comparison to the 'present' (aka F-16 Block 60), I intend to give the Block 60 performance every reasonable benefit of the doubt in surveying the drag differences between the Block 50 and Block 60. I choose to do so in part because I expect the non-wave drag differences between the Block 50 and 60 aircraft will be seen as less important compared to the wave drag contributions. (This should be seen as reasonable, if only because of the relative contributions of the factors proportional to the drag total). I do not expect to be able to characterize the effect of the differences exactly, but we should be able to identify the differences and their effect within a comparatively narrow range with the data in hand. 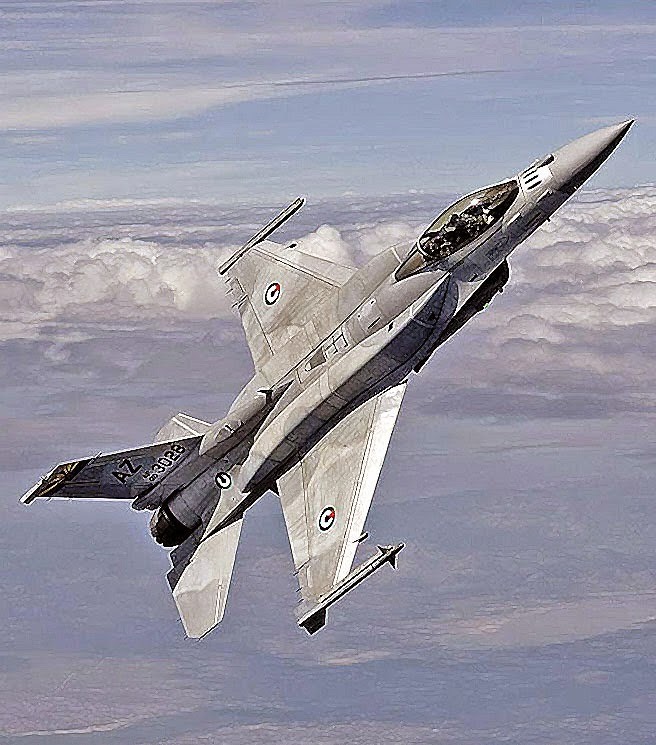 F-16C Baseline: Full Internal Fuel, 2 AMRAAMs on wingtip launchers and full 20mm load. 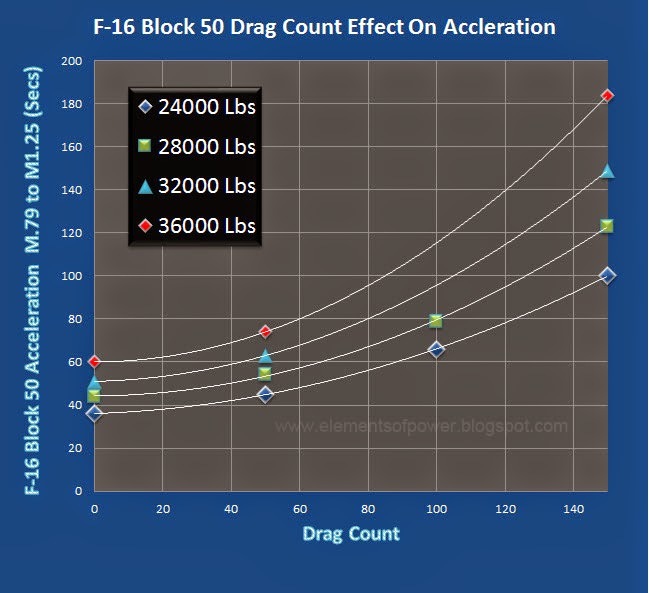 F-16 Block 50 Drag Count and Weight Differences. We'll use this information to characterize the effect of the Block 60's external configuration and weight on its total 'drag'. The four AMRAAM load was suggested by 'Tim A,', though I kept the CFTs empty because I wanted to keep the Block 60 configuration reasonably light. 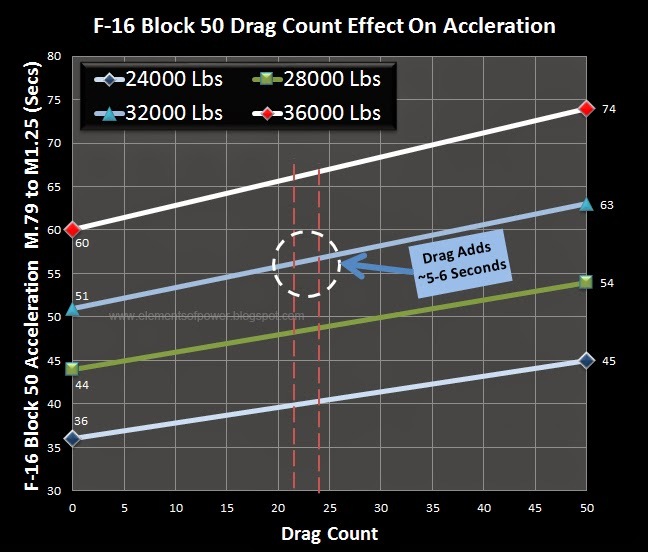 The drag differences between the Block 50 and Block 60 F-16 configurations are reduced to the effect of the Block 60's greater total weight and increased drag profile. 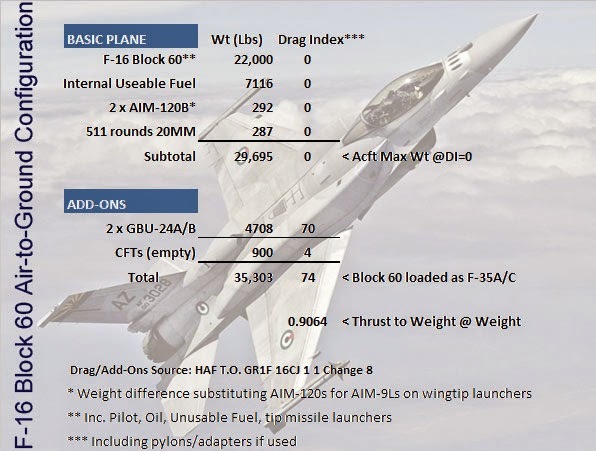 For the drag numbers in the selected Block 60 configuration I'm using the HAF F-16 manual and an article on CFTs found here. The CFT article mentions specifically the CFT set as "12%" of 300 gallon tank, but that is a general statement that may be the average drag reduction for the 300 in the subsonic region. I selected using 4 as the estimated DI for the CFTs for the transonic region, but even if it is less (perhaps '2') the difference between DI totals of 22 and 24 won't be seen in any guesstimate we can do. In addition, I have elected to treat the Block 60 basic airframe drag the same as the Block 50 in spite of the fact the Block 60 is designed to use and carry sensors/systems that are specific to the type. These Block 60 systems, while they are no doubt 'lower drag' than the Block 50's 'add on' LANTIRN pods etc, they are also not "drag free". This is especially treu of the Sniper XR-derivative targeting system installation shown above. To give the Block 60 every advantage in the quantitative analysis, I choose to ignore the drag of the Block 60's unique installations. I do so for a couple of reasons. 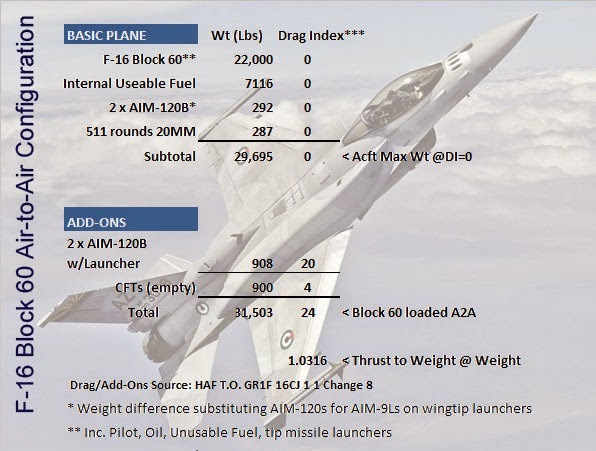 First, I doubt it will make as much 'drag difference' as accounting for all the weights involved, and second there is photographic evidence that while the Block 60-specific targeting system installations were initially expected to be carried all the time, in practice it hasn't always the case(Google "Block 60 F-16" and check out the photos). We'll just keep the 'drag factor' of these systems in the back of our minds going forward. The key differences between the two engines that drive the increased thrust for the -132 variant aren't relevant to our analysis but for the sake of completeness, let us observe that the -132 has a slightly higher airflow than the -119, and that is at least partly due to the ever-so-slightly lower bypass ratio (more 'fast hot' air) for the -132 design. There are also some 'efficiency' improvements in the -132, some of which can be retrofitted to -129 engines for better durability if the users want to pay for the 'goodness'. Normally, I would be loathe to try and extrapolate what a difference in engine thrust between planes would mean to the relative transonic acceleration performance, but given we are looking at essentially the same aircraft at different weights (and thrust to weight ratios), I think we can make a reasonable accommodation for the effect (on Block 50 acceleration) of the the extra thrust based upon looking at comparable Block 50 thrust-to-weight ratios. We can-- and WILL!-- apply that analysis to arrive at a fairly narrow region of impact of the higher thrust to the Block 60's transonic acceleration performance estimates. We'll do this in a two-step process to bracket the likely transonic performance of the Block 60 compared to the Block 50. 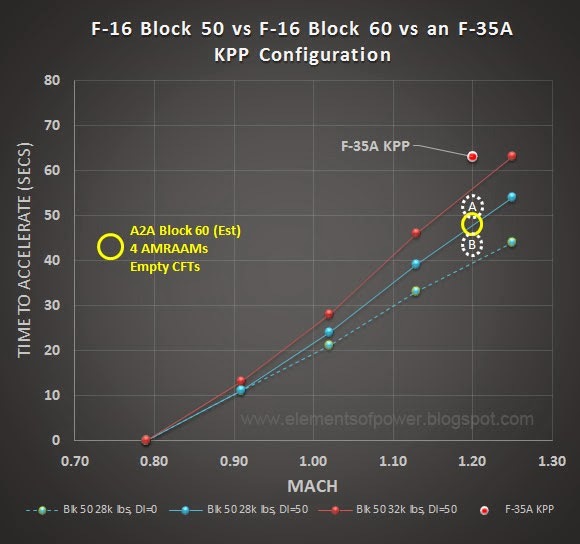 It doesn't make a difference in what order the process is applied, but we'll start with the simplest to explain first, and we'll just keep the F-35A KPP performance in sight as a sort of benchmark for now. As mentioned earlier, we can use the HAF T.O. GR1F 16CJ 1 1 Change 8 document containing the max acceleration performance data for the Block 50 to derive an approximation of the effect of the Block 60's weight and drag relative to the Block 50, We've approximated the drag index of the Conformal Fuel Tanks and added the known drag index of the Block 60's launchers and extra (2) AMRAAMs to arrive at a drag index 'upper' of 24 over a baseline Block 50. As this drag index is approximately halfway between a known DI=0 and DI=50, and the Block 60's selected configuration weight of 31,503 lbs is slightly lower than the the Block 50 32K lb configuration, the effect of weight and drag differences ALONE would indicate a transonic acceleration time of about 53 seconds (plus or minus). This is a performance better than the Block 50 at 32K lbs (DI=50) but not so good as a Block 50 at 28K lbs and with a DI=50 (obviously). 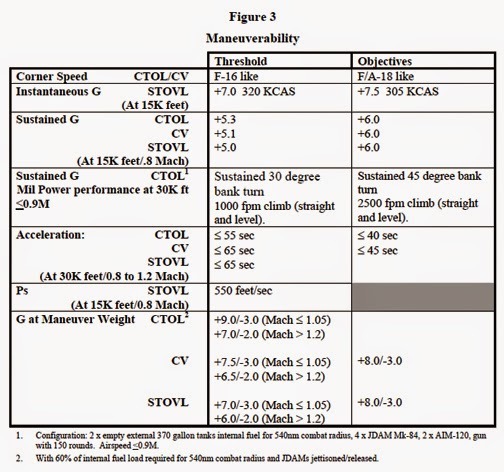 Note: This step would have been a lot easier to show/follow if the Block 50's DI=0 performance at 28K and 32K lbs were 'feasible' configurations. We could have just bracketed the DI=0 and the DI=50 values for a 32K weight. Estimating the Effect of Block 60 Weight Drag ONLY based upon Block 50 data. This step is a little more involved than the other. We again will rely on using the Block 50 data from HAF T.O. GR1F 16CJ 1 1 Change 8, but in estimating the impact of this factor we have to normalize the data for the Block 50 before applying it to the Block 60. In the first section of the following graphic, I have charted the relative thrust-weight values for both the Block 50 and Block 60 aircraft. Notice how close both the absolute values and the relative step functions are for the highlighted ratios shown for each F-16's Block data. The highlighted Block 60 ratios and step functions are slightly lower than the Block 50's but still very close. If we ignore all other differences between the ircraft and assume acceleration differences are purely a matter of thrust to weight, and generously assume all increased thrust-to-weight for the Block 60 translates proportionally into better acceleration at every weight AND look at the acceleration times for the Block 50 configurations between weight steps, we can express those step 'time deltas' for the Block 60 as a function of the ratio of Block 50/Block 60 thrust ratios times the time deltas for any selelcted drag index. If that sounds confusing, it is because it is...without a spreadsheet. To simplify, for this specific example I divided the 'Raw' Block 50 Thrust-Weight Ratio for the 28K weight by the 'Raw' Block 60 thrust-Weight Ratio for the 32K weight (1.0357143/1.0156325). 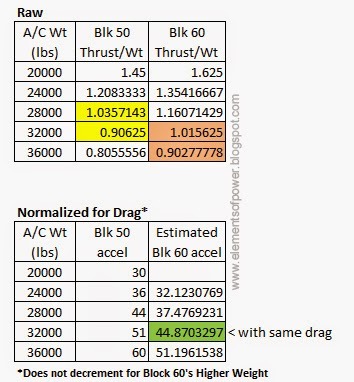 I then treated the Block 50 28K DI=24 acceleration time shown in the 'Normalized for Drag' portion of the chart below as being solely a product of thrust-to-weight, multiplied the Block 50 acceleration time for the 28K weight (44 seconds) times the 'ratio of thrust ratios used. Stated more clearly without an audit trail: We assume the heavier block 60 will accelerate like a Block 50 at the same thrust to weight ratio. I am giving the Block 60 further benefit of the doubt by not accounting for the higher weight, but that's OK! : we're estimating remember? Estimating the Effect of Block 60 Weight Drag ONLY (A) and Block 60 Thrust to Weight ONLY (B), based upon Block 50 data. Block 60 Transonic Acceleration Estimate: A Near-32K pound Block 60 with 4 AIM-120s accelerates like a Block 50 F-16 DI=50 at 28K Lbs. So in the end, the big advantage of the Block 60 aircraft appears to be the increased range and better/equal performance at a slightly higher weight than the Block 50. Nothing to sneeze at, but nothing too surprising either. But HEY! What about the Block 60 in comparison to the F-35A KPP performance? We've covered the whole F-35A configuration setup already elsewhere. The big thing we do not really 'know' still is how much fuel is aboard the F-35 for the KPP measurement. We DO however understand that the KPP was written based upon a load of two 2K Lb JDAMs and 2 AMRAAMs carried internally. If we simply swap the two JDAMs for two more AMRAAMs the F-35A's weight would be about 4,000 pounds less (Most 2K Pound JDAMS weigh more than 2K lbs with the kits). 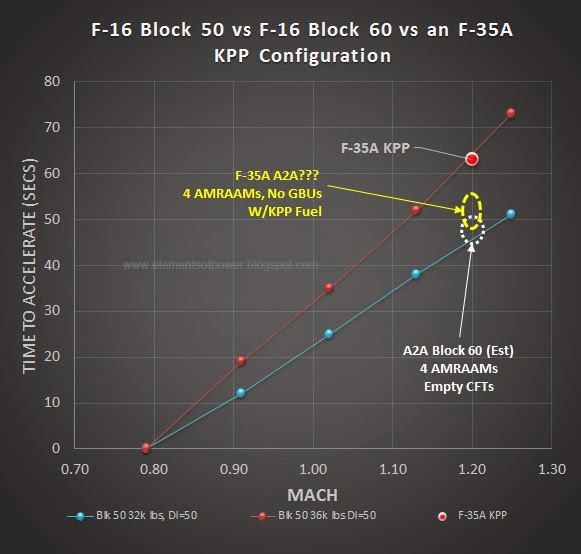 Housekeeping: Note that the Block 50 data in hand starts the acceleration run at Mach .79 and not the Mach.8 used for the F-35 KPP performance. That's OK! At the weights we are looking at, this translates to about 1 second or less difference: well within any margin of error. It doesn’t really matter if the F-35A configuration for the transonic acceleration KPP includes 2 JDAMs or if the JDAMs have already been dropped. It really doesn’t matter for three fundamental reasons, only one of which we’ve discussed in any detail. The KPP configuration and weight ‘is what it is’, and all our analysis has been focused on the relationship between those factors that affect transonic acceleration, and how (and how much) changes to those factors affect performance. We do not ‘know’ the payload carried for the KPP values for any of the explorations we’ve made, and I’ve been comfortable in doing these parametric examinations using the assumption that the internal payload for the F-35A consisted of (2) 2K JDAMs, (2) AMRAAMs and a nose load of 25mm cannon rounds. Unlike an F-16 or any other aircraft that carries bulk fuel and weapons externally, it really didn’t matter what the F-35 was carrying internally from a drag POV except as in how whatever weight the F-35 was bearing increased the drag due to lift. While I used the assumption that the plane was carrying the JDAMs, We’ve never asserted or implied a total F-35 weight as the basis for the estimates. We have seen that at whatever the baseline weight basis is, the F-35A in its KPP configuration (whatever that is) accelerated from M.8 to M1.2 very much like an F-16 Block 50 at 36K lbs and a Drag Index =50. I then posed a ‘what if’ scenario where the F-35A was 4K Lbs (or so) lighter to estimate performance at an “X”-4K pound F-35A. I took away the hypothetical 2k JDAMs because they were convenient to quantify. This is acceptable because, as I have mentioned many times, these analyses are about gaining an understanding of the factors involved and their impact/effects. The data in-hand can’t be used to prove anything either way, it can only point to ‘possibilities’. …do we assume that the transonic acceleration KPP falls within both the “post-weapons release” AND “50% fuel” ‘generalities’, or just one? Or the other? Or neither? Looking at the key table in the Bowman paper…. We see two distinct CTOL (F-35A) loadouts specified for two KPPs in the footnotes. Are these the only two ‘possible’ exceptions to the “general” configuration to which Boman refers, or are they the ONLY exceptions? Are they just configurations that Bowman highlighted because he thought they were important to his arguments? We don’t know. I’ve always been struck by the reference to the 2 empty external tanks in the first footnote, given the F-35 at this time does not carry external wing tanks and to-date they have not been seen as ‘value-added’ enough to be pursued by the program (an interesting topic for another time), but of interest to our discussion here is the second footnote as it relates to Bowman’s introduction to the table. And the ramifications of this point are HUGE. Much of it relates to what will be the final weight/drag of the aircraft itself, but some of it relates to how the ‘books’ are being kept that prevent any definitive performance statements until SDD is complete (see Reason #3). The weight uncertainty factor we touched upon under Reason #1 looms larger than many people might realize. We can assume all KPPs are based upon all or part of a fuel load required to achieve some unknown-to-us mission utility, objective and/or point, so weight is a factor in all KPPs. Weight management of the F-35A is important for meeting air vehicle performance requirements and structural life expectations. These estimates are based on measured weights of components and subassemblies, calculated weights from approved design drawings released for build, and estimated weights of remaining components. These estimates are used to predict the weight of the first Lot 7 F-35A aircraft (AF-72), planned for delivery in August 2015, which will be the basis for evaluating contract specification compliance for aircraft weight. -- According to these reports, the program has reduced weight by 16 pounds in CY14 (from January to October estimate). The current estimate of 29,016 pounds is 355 pounds (1.2 percent) below the planned not-to-exceed weight of 29,371 pounds. -- The program has demonstrated positive weight management of the F-35A over the past 38 months, showing a net loss of 123 pounds in the estimates from August 2011 to October 2014. The program will need to ensure the actual aircraft weight meets predictions, as well as continue rigorous management of the actual aircraft weight beyond the technical performance measurements of contract specification in CY15 through the balance of SDD to avoid performance degradation that would affect operational capability. An empty weight that is 355 pounds lower than the modeled KPP weight implies a much larger weight in fuel that does not to be carried to achieve the F-35A’s combat radius (or ‘60%’ mission radius/endurance distance/time). JETA-1 fuel weighs 6.71 lbs per gallon. How many pounds of fuel can be left behind by not having to carry 355 pounds of dead weight over 1200+ nautical miles out-and-back? We don't know. the uncertainties are certainly adding up. While the AF-72 aircraft is the target point that is “the basis for evaluating contract specification compliance for [F-35A] aircraft weight”, we also do not know how much margin is in the “planned not-to-exceed weight of 29,371 pounds” target weight. I’ve seen indicators that prevent me from completely assuming the weight targets are the weight assumptions used for KPPs. If the targets aren’t the limits, then there is further weight margin that the KPP model may not be accounting for in performance modeling. I personally wouldn’t assume this to be the case, but we don’t know. Time will tell. Third Fundamental Reason: The KPP Ground Rules and Assumptions and/or their Impacts aren't fully known or accounted for either. The ‘unknowns-unknowns’ here might outweigh any factor we have examined in trying to compare an F-35A to any legacy aircraft. The 'known-unknowns' are bad enough. Example? We know the KPPs are based upon a ‘pessimistic’ engine performance with 5% thrust and fuel efficiency degradation (Ref #8 here). We do NOT know what impact that factor has on the overall ‘standard’ aircraft weight or acceleration, but just as important, we do not yet know if that the ‘engine of record’ in the models is the original 40K Lb thrust engine, or an engine with the newer 43K Lb thrust rating. So, what else do we NOT know about the model GR&As? I don’t lose any sleep over the F-35A’s transonic acceleration because in the end it still gets back to the fundamental fact that you can always just ‘unload’ the plane to shed all that wave drag due to lift… if you so desire. Using such a technique, the F-35A should be able to run away to, from, or with any current or future aircraft through the transonic region unless that other aircraft is heavier AND with a higher Thrust/Weight ratio, and there are always other ways to deal with such contingencies (TANSTAAFL). I’ll THINK about getting concerned when the JPO and users get concerned. 1. While I used the Bowman paper data, I put no weight on what was discernible as Bowman’s own analyses or observations surrounding the data. I treated the paper in this way, because I cannot divine if his positions/opinions come from ‘fact’ or from his ‘views’ on the facts: especially since I see several assertions/conclusions (unrelated to any of the KPP discussions so far) within that I know are erroneous--if only through their over-simplification. Further, Air Command and Staff papers tend to be advocacy papers and Bowman’s certainly falls into that description. I know enough about ACSC papers to know that they are just like almost all college papers, they are usually done for a ‘grade’ and not posterity. False data can get you a failing score in ACSC, but I’ve not seen evidence that faulty reasoning will-- unless you argue it ineffectively. 2. As an aside, if I HAD to pick a fuel quantity for the transonic KPP I would pick a value above 50% fuel on the assumption that the operators would desire at least 50% fuel on hand after a transonic dash, presumably to get to or get away from a fighting position. 3. For the F-35B model, the obvious weight constraint beyond those affecting range, acceleration and turning is Vertical Lift Bringback (VLBB) weight. For the F-35C, the Maximum Carrier Landing Weight is a driver as well as whatever weight will be essential to NOT bust the approach speed limitations. 4. One example is a chart online (that is marked US/FOUO, so I won’t post or link to here) shows the F-35C’s Weight Status in 2012 with a 'target' weight well below the key Carrier Landing Weight limit.